Look who’s here? A dog lover isn’t it? Here are some facts about the dog you might find interesting. Dogs are cute friendly beings who hold a special place in our heart. They are so obedient and playful with whom we like to spend our time. They love and care about us so much that we never want get apart from them. Want to learn something? You have come to the best place. 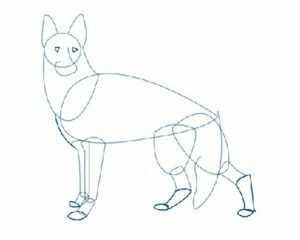 Here, we will be sharing all our techniques of how to draw a dog and draw a realistic dog face and various other things.. 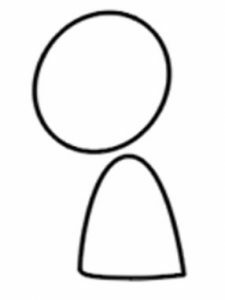 These kinds of figures are quite simple and help you develop your drawing skills. If you are a learner, then you should first try to draw all these figures for practice. If you are good in drawing, then we also have some really cool figures to test your mastery. So check out your skills? Are you really good enough? Hehe… That was enough. Coming back to drawing, it is something which involves a lot of creativity to excel. So keep on practicing and check out our various links to practice more. 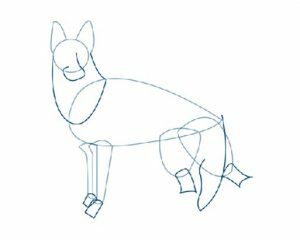 How to Draw a Dog step by step for beginners? 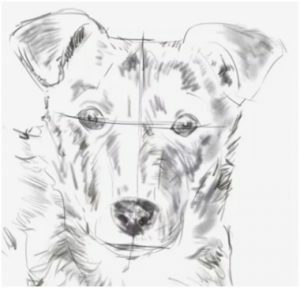 It looks like it is your first drawing of a dog. So, children get relaxed, as it is nothing much difficult. You will learn it by practicing it a few times. 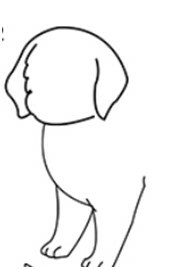 As you are new, why don’t we try drawing a simple cartoon dog? 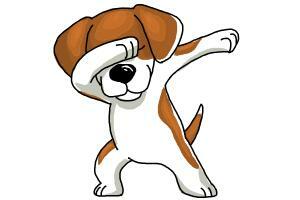 Remember those days, when we used to watch cartoon and saw those little cute dogs. Today we will to sketch something like that in our papers. So grab a pencil and a paper and get ready. Here we go. 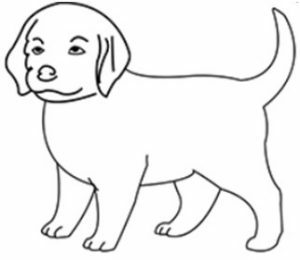 Step 1 In this step, we will just draw the outline for the dog. 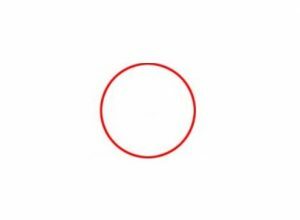 So draw a circle for the face and a stretched D like shape for the body as shown in figure. 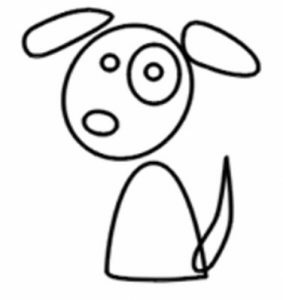 Step 2 Draw the eyes of the dog by small circles and tail as shown in the figure. Step 3 Draw the ears which are oval like shapes and the mouth and draw a concentric circle on one eye. Step 4 Connect the ears and body by small rectangles as given. Also draw the tongue which is a half oval. Step 5 Follow the pictures shown for completing the body and then finally color according to your wish. Then you are complete with cartoon dog. 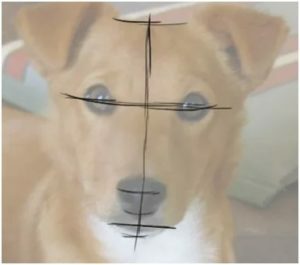 How to Draw a Realistic Cute Dog step by step? 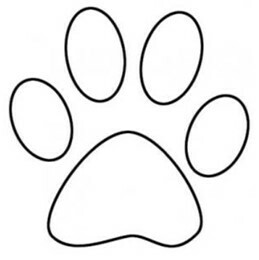 Step 1 First we will outline the body of the dog by drawing two shapes. A small circle is drawn which becomes the head of the dog. 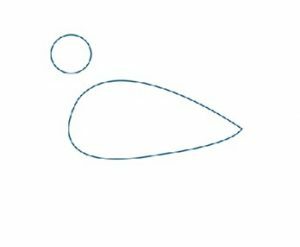 A water droplet when turned 90⁰clockwise shape is drawn for the body. Step 2 Now we start to draw simple shapes for other body parts. 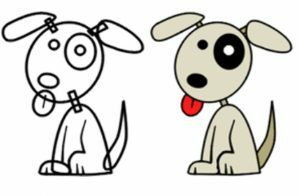 Shapes for ears are drawn which are coming off the circular head. Two thick imperfect ovals are drawn for the back legs and a couple of thin long shapes are use for front legs. Step 3 Now we join the head and body by drawing the neck which connects two opposite sides of the circle. 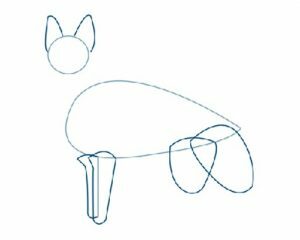 The tail and mouth is drawn using lines as per figure. The feet is also completed by small rectangular shapes. Step 4 In this step we complete the bottom part of the legs. We draw a line connecting the head and lower body. The eye is also completed by small triangles. Step 5 At this stage, the outline is complete. Now we start to give details. 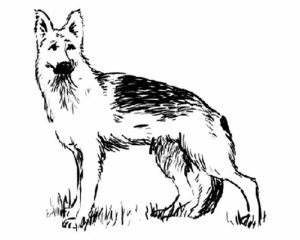 The fur of the dog is established by drawing lines over and over and the eyes and nose are darkened. We then keep on drawing concentrated small lines over the body and in the ground for its shadow. It will be complete by using some colours or ink. Remove any remaining outlines. 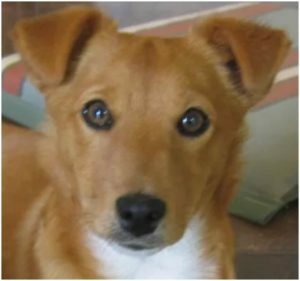 How to Draw a Realistic Dog face? Step 1 Collect a picture of your dog facing towards you. We only need the face and it should be clear. Step 2 First of all we need to draw a reference line for the center of the face. It should pass between the eyes and cross the nose. Now draw an outward line from one eye to other. 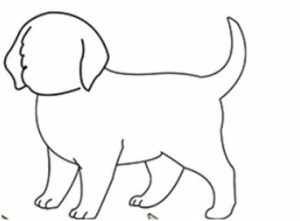 Step 3 Try to trace the outline of the dog using a tracing paper and include the ears also. Use light touches to sketch the head in detail. Add some faint lines near the eyes and forehead to show the folds of skin and fur. Step 4 This is step is the most difficult which includes light shading. Use light touches for highest details. Use short strokes in case of short fur and hard strokes in case of long fur. Shade the dog’s nose for smoothness. Use eraser when you want to decrease the concentration and give the final details. 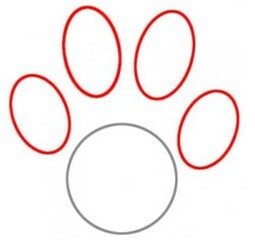 Step 1 First we draw a circle for the main paw. 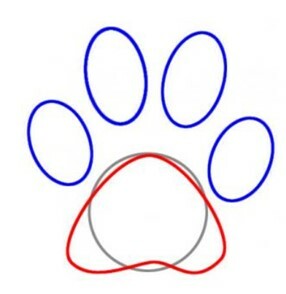 Step 2 Now draw four ovals for each toe of the dog. Step 3 Now in the last drawing step, we will draw the shape of the foot padding. Then erase the first circle that we drew in the first step. Step 4 Color it to finish off your work. 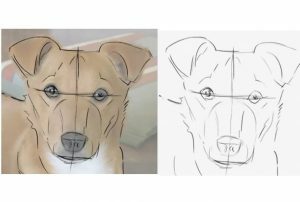 How to Draw a Cute Dog step by step? 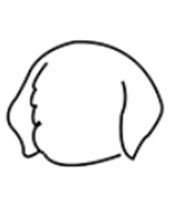 Step 1 Draw the face of the puppy by showing the folds of its cheeks as illustrated. Step 2 Draw a curved line from the chin till the left fore leg and then draw the other leg. 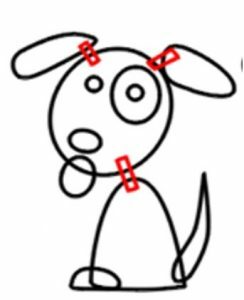 Step 3 Draw a curvy line from the left ear to extend the back of the dog. 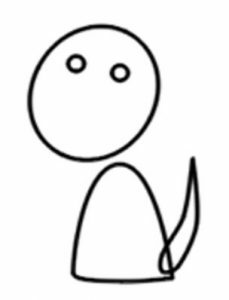 Also draw the tail, belly and back legs as illustrated. Step 4 Just finish up by drawing simple eyes, nose and a curved line for mouth. Color it as you wish.